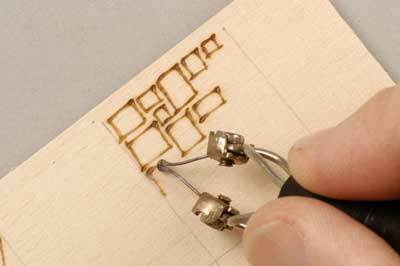 Pyrography is one of the oldest traditional crafts. 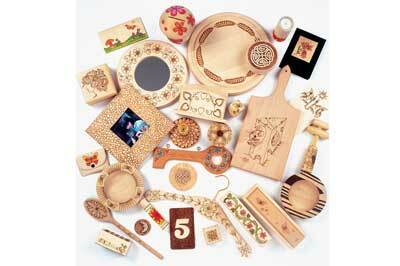 It is the burning of designs on items, usually wooden, but it can also be used on leather, cork, fabric and paper. 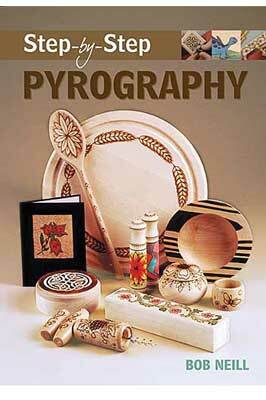 Traditionally, pyrography was used to decorate domestic utensils such as bowls, spoons and drinking vessels. Early examples from many cultures can be seen in museums in London, Paris and other major cities. These artefacts include honey pots from Madagascar, a bamboo goblet from India, a wooden beer mug from Estonia, carved dolls from the Ivory Coast, and wooden boxes from Poland. 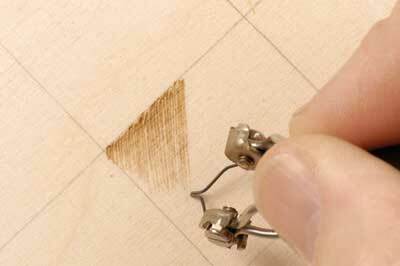 During the Arts and Crafts movement, pyrography was used to decorate large pieces of furniture, sometimes in the form of relief carving. 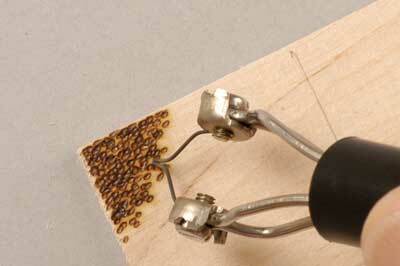 I have used most machines available, from soldering irons to the hot wire machine I now use. 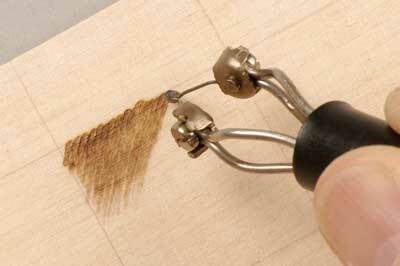 This is more expensive but is the choice of most professional pyrographers. Most people have well-stocked tool boxes but you may need to buy a few of the items below. 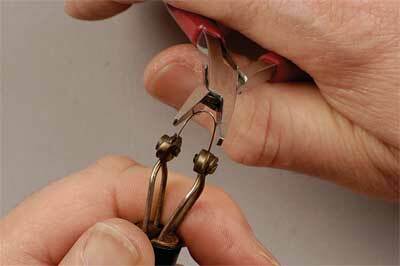 Craft knife or pencil sharpener: your pencil must be sharp for good, clear drawings. Useful for planning designs? 1. 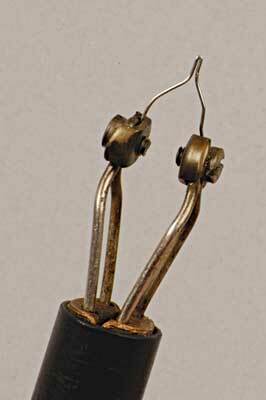 Do not touch any part of the hot wire nib. 2. 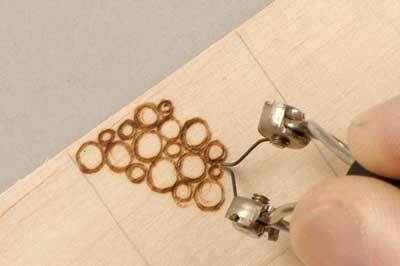 Hold the pyrography tool as close to the nib as possible but take care not to touch the metal elements. After long periods of working, the elements can become uncomfortably hot. Some models have guards to protect your hands. 3. Keep the nib well away from your eyes. 4. 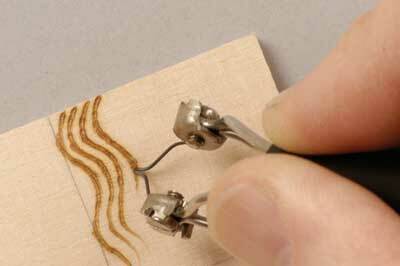 Make sure children are supervised when using pyrography equipment. Make sure the room is well ventilated when you are working. Some surfaces, such as old wood, driftwood or leather, can give off nasty fumes. 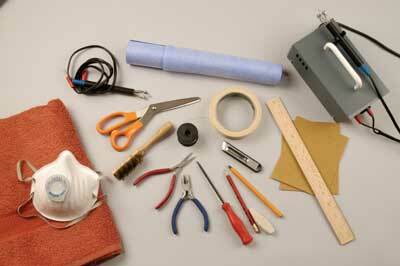 If you have an electric air purifier or a humidifier, use it to remove smoke from the work area. A dust mask should always be worn when working. This will help to protect against breathing in smoke from the burning wood, or any dust particles produced when you are sanding your work. 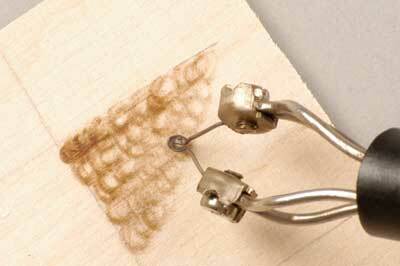 .1 Take care that you do not breathe in fumes when you are working with fixative, spray sealers or varnishes. 2. Make sure the room you are working in is well ventilated. 3. Wear a dust mask to help prevent you breathing in harmful fumes. 4. Always read carefully and follow the instructions given by the manufacturer regarding the use and storage of products. 5. 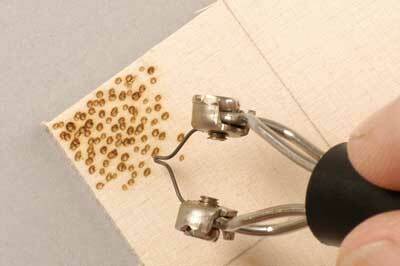 Mop up any spills immediately using kitchen paper or rags, and dispose of them carefully. 6. Take care to replace the lids of all products securely after use. 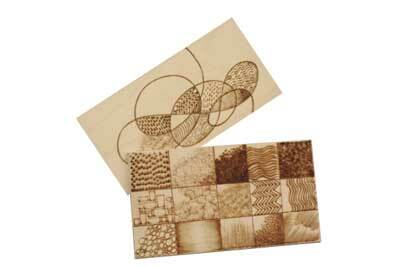 Blanks for pyrography are widely available. For just one item, try local hardware stores or the kitchen departments in major stores or supermarkets. 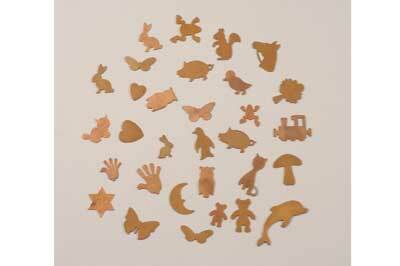 Blanks are also available in bulk from specialist suppliers, which brings the price per item down considerably. 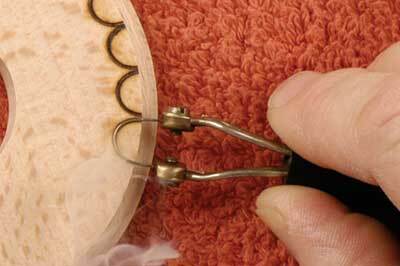 You may have a friend who turns wood, which is how I obtain bowls and needle cases. 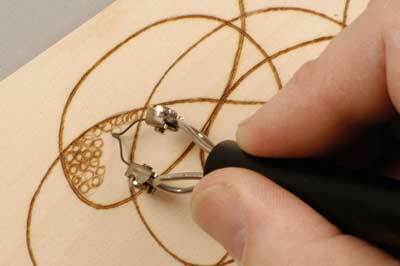 From a distance, a pyrography design looks like a pencil drawing; close-up, it resembles an engraving. 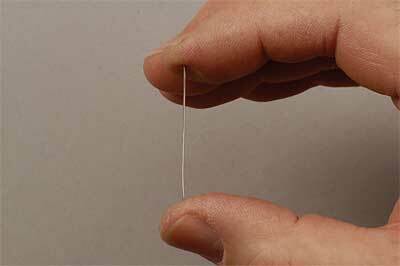 Line quality varies depending on the surface. On soft woods like pine (Pinus spp. ), it tends to blur and run to create smoky areas. 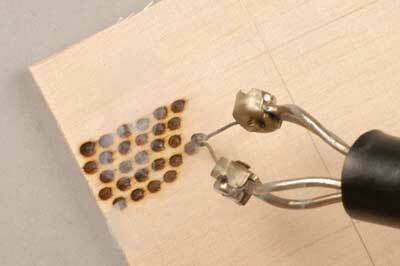 A line burnt on harder wood, such as sycamore (Acer pseudoplatanus), is cleaner and more exact. 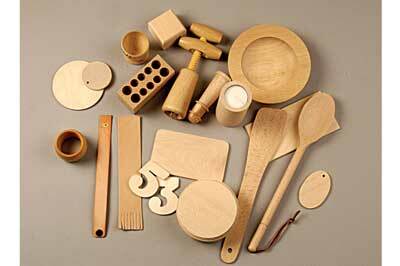 The woods I mostly use are sycamore, beech (Fagus sylvatica) and good-quality birch (Betula pendula) ply. Lime (Tilia vulgaris), holly (Ilex spp.) 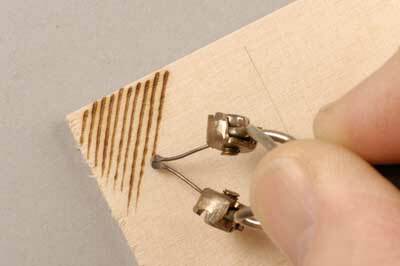 and maple (Acer campestre) are also good choices for pyrography, but soft woods tend to give an uneven line when burnt, and other types of wood may be too hard or too dark to produce a good effect. On more unusual choices of material, including spalted beech or burr maple, being bold and adventurous can produce striking results. 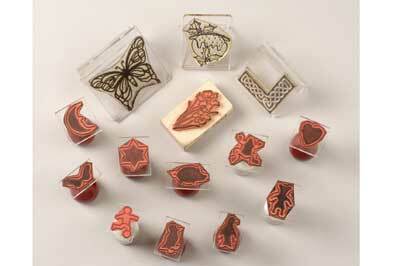 When selecting rubber stamps, choose ones with good raised outlines and no blocked-in areas. The easiest ones to use are those made from clear plastic so that you can position them exactly as required on your chosen surface. A wide variety of metal templates are available from specialist craft shops, and over the years I have built up quite a collection. Individual templates are reasonably priced, and they can be used again and again so they are good value. You could punch out your own card shapes, or cut designs from thin card using a pair of scissors as well as using plastic stencils. 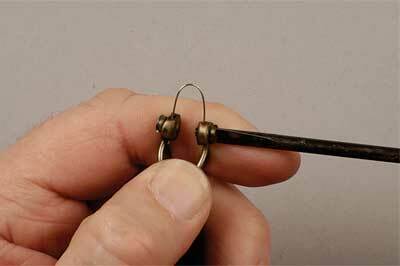 Nibs are shaped from nickel chromium wire. There are four grades: 26 SWG - the finest, 25 SWG, 24 SWG and 23 SWG - the thickest. The best one to use is 25 SWG. 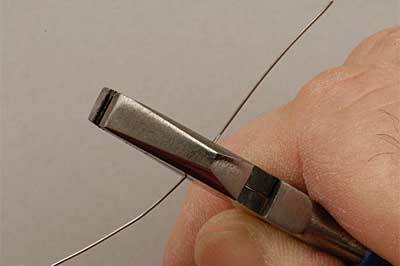 For most work, the wire is pinched to a point. Experiment to produce a range of different shapes. Ready-made spoon points are available. 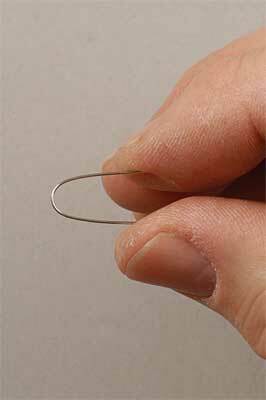 They can also be made by twisting the U-shape so that you have a small circle at the tip. 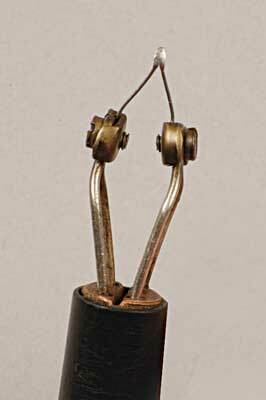 Hammer this out on a hard metal surface. The art of burning requires concentration. 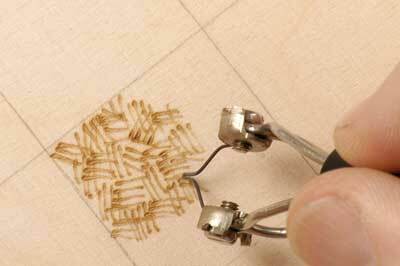 The grain of the wood will either assist smooth flow or go against the direction of the tool. By varying the stroke, pressure and heat, it is possible to produce thin and thick lines, deep grooves, dots, textures and tones. 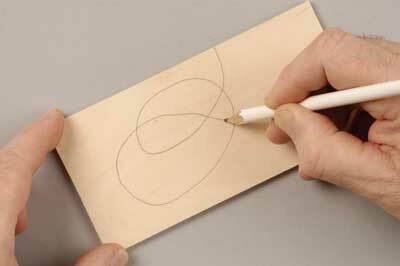 Hold the pyrography pen as you would a pen or pencil, and keep your fingers as near the nib as possible at the bottom of the black plastic sleeve. Do not touch the wire support as it can get very hot. 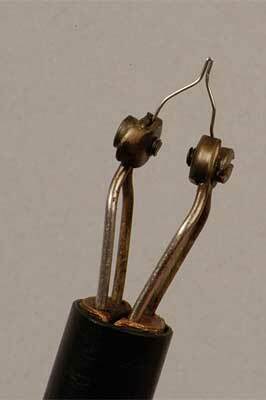 For most woods, the heat control knob should be set so that the wire nib shows just a hint of red. Some woods require a higher heat setting, while veneer and materials like leather, card and handmade paper need less heat. 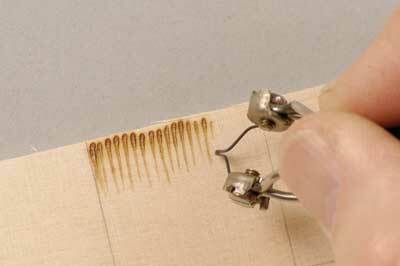 Too high a setting will cause scorching on either side of your burnt line. The burning technique is similar to painting or sketching. Work with a smooth movement, starting at the top of the design and working with light, short strokes. Work slowly, to give the wood time to burn. 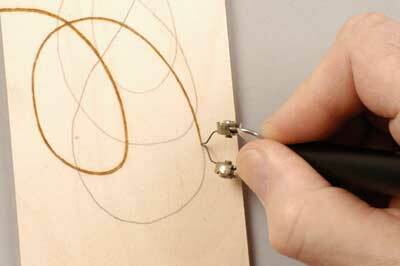 At first, you may get blobs and uneven lines - so keep practising. Take a small rectangle of birch plywood. Using pencil, draw a random line or draw in a grid pattern. Fill in sections using different techniques.